According to philosopher Jeremy Bentham, the ultimate goal of any action is to provide the greatest amount of happiness to the greatest number of people. Take the U.S. government for example: it awards grants to the scientific research projects that provide the most benefits for the maximum number of people. As a result, scientific research on disease in America usually centers around the most common health issues. The National Institute of Health reports that cancer, cardiovascular disease, and HIV/AIDS, three diseases which affect hundreds of thousands of patients, received the most federal funding in 2016. However, studying uncommon diseases is also important, as it helps underserved patients with rare health problems. Yale professor Pramod Mistry studies one of these rare conditions, a genetic disorder of metabolism called Gaucher disease. Recently, he combined his work on this rare disease with research from neurologist Sreeganga Chandra on Parkinson’s disease, a neurodegenerative disorder that affects movement. This joint project, led by Yale graduate student Yumiko Taguchi and published recently in The Journal of Neuroscience, showed that the mutations that predispose patients to Parkinson’s disease are also responsible for Gaucher disease. For the first time, the scientists pinpointed a common mechanism linking Parkinson’s and Gaucher disease, setting the foundation for potential new treatments. Portrait photograph of Yumiko Taguchi, the Yale graduate student who led the effort on this research project. While learning about common health problems is certainly important, Mistry always had an interest in rare diseases. “At a very human level, I was touched by how underserved these patients were by the medical profession,” explained Dr. Mistry. His passion for helping patients with rare diseases led him to study Gaucher Disease—a genetic disorder caused by mutations in a gene called GBA. These mutations reduce or eliminate the ability of the enzyme to break down certain fatty molecules, also known as lipids, leading to the accumulation of lipids at toxic levels within cells, damaging tissues and organs. Over the years, Mistry encountered a number of cases where patients with Gaucher disease also developed Parkinson’s disease. In response, Mistry partnered with the Chandra lab to study the biology underlying this correlation. “It was known that mutations in GBA are the most common risk factor in developing Parkinson’s disease, but we now wanted to determine the molecular mechanisms,” stated Taguchi. The researchers hoped that to learn more about the relationship between Gaucher and Parkinson’s disease at a molecular level, and, by extension, to discover potential targets for treating Parkinson’s disease. Although mutations in the gene that encodes α-synuclein are the direct cause of Parkinson’s, there are particular risk factors that make the disorder more likely to occur. For example, in a healthy individual, the enzyme GCase1 catalyzes the degradation of glycolipids, lipids attached to sugars, and prevents the accumulation of α-synuclein aggregates. Most people have two functional copies of the gene for GCase1, and if either one or both of those copies has a mutation, then that individual will be more susceptible to Parkinson’s disease. People with only one mutated copy have a 5-fold increased risk, and those with both copies mutated have a 20-fold increased. The scientists wondered how GCase1 mutations might give rise to Parkinson’s disease, on a molecular level. They were especially interested, since GCase1 plays a key role not only in Parkinson’s, but also in Gaucher disease. With Gaucher disease, if someone has a mutation in one copy, they won’t show symptoms because the other copy makes enough GCase1 protein for normal function. However, if someone has a mutation in both copies of the gene, they will be symptomatic, since they cannot generate sufficient GCase1 protein. In patients with Gaucher disease, symptoms occur because the protein is not present in high enough quantities to break down a particular complex lipid called GlcCer, so lipids build up in cells. Thus, the researchers proposed that the complex lipid GlcCer may also contribute to the development of Parkinson’s disease. Since mutations that encode α-synuclein and Gaucher disease both correlate with Parkinson’s disease, the scientists wanted to study the relationship, if any, between α-synuclein and Gaucher disease. A test tube study showed that the lipids accumulating in Gaucher disease accelerate the build-up of α-synuclein. The findings also pinpointed the two lipids, GlcSph and Sph, that promote α-synuclein aggregation more than any other lipids in human cells and neurons. After the scientists determined the link between Parkinson’s disease and the lipids associated with Gaucher disease, they decided to test how Gaucher disease mutations affected the manifestation of Parkinson’s disease. This time, however, they wanted to conduct the experiments in vivo on mouse models instead of in vitro in test tubes. The researchers were curious about how the abnormal breakdown of lipids seen in Gaucher disease impacted Parkinson’s disease, so they looked at lipid levels in the brains of young mice with Parkinson’s disease. The scientists discovered that accumulation of the lipid GlcSph at concentrations seen in Gaucher disease produces an increased amount of the protein α-synuclein. In addition, the researchers noticed that as the concentration of GlcSph increased, its effect on α-synuclein aggregation increased. These two findings suggest that the accumulation of GlcSph may exacerbate the aggregation of α-synuclein in the brain. Another relationship studied was that of the accumulation of lipids in the brain and the mortality of mice with Parkinson’s disease. The data showed that the mice with Parkinson’s disease died prematurely, and that these mice who died prematurely had five times as much of the protein GlcCer as normal, implying that mutations in the GBA gene accelerated the development of Parkinson’s disease. To explain these findings, the researchers concluded that in mice with Parkinson’s disease, α-synuclein aggregated in regions where GlcCer had built up. Their results suggest a strong correlation between Parkinson’s disease-related morbidity and mortality and increased lipid levels in the brain. “Unfortunately, there is no cure to Parkinson’s disease. You can relieve the symptoms, but that’s it,” lamented Yumi. However, this new study provides hope for patients suffering with Parkinson’s disease: the scientists were able to pinpoint specific enzymes in the metabolic pathway that may lead to the formation of Parkinson’s disease. Out of all the various lipids that accumulate due to Gaucher disease, the researchers found that the build-up of GlcSph caused the biggest increase in the risk of developing Parkinson’s disease, since GlcSph accelerated α-synuclein aggregation the most. Thus, targeting the enzymes involved with GlcSph degradation may offer a potential treatment option for Parkinson’s disease. The data pointed to two particular enzymes, ASAH1 and glucocerebrosidase 2 (GBA2), as the most promising targets for treating Parkinson’s disease. None of these findings would have been possible without the teamwork between Mistry, with his Gaucher disease expertise, and members of the Chandra Lab, with their neurology expertise. This case is one of the many important interdisciplinary science research projects changing the way we understand disease. Mistry supports interdisciplinary research as a way for different branches of knowledge to converge in discovery. “Any meaningful science now is team science. The more collaborations you do, the better and more meaningful your results are going to be,” asserted Mistry. Sunnie Liu is a first-year prospective art and history of science, medicine, and public health double major on the pre-med track in Morse College. 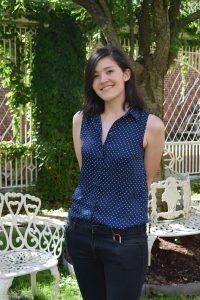 She writes, photographs, designs, and illustrates for the Yale Scientific Magazine and volunteers to teach science and mental health to students in New Haven public schools. The author would like to thank Yumiko Taguchi, Justin Abbasi, Dr. Sreeganga Chandra, and Dr. Pramond Mistry for their time and for their enthusiasm about their research. Bembi, B., S. Zambito Marsala, E. Sidransky, G. Ciana, M. Carrozzi, M. Zorzon, C. Martini, M. Gioulis, M. G. Pittis, and L. Capus. “Gaucher’s Disease with Parkinson’s Disease.” Neurology 61, no. 1 (July 8, 2003): 99-101.